Fish has a varied recommended age of introduction with 6-7 months old being the earliest; please be sure to check with your pediatrician about introducing fish to your baby! When can I introduce Fish to my baby? As we mention in our Introducing Fish to Baby page, the age for introducing fish to babies varies. Many sources suggest waiting until after 3 years old however this applies mostly to shellfish and crustaceans. Other sources say that introducing fish to a baby at 9-10 months old is perfectly safe. Many are even suggesting that babies may be introduced to fish between 6-7 months old. You see, the recommendations for introducing fish to baby are changing! 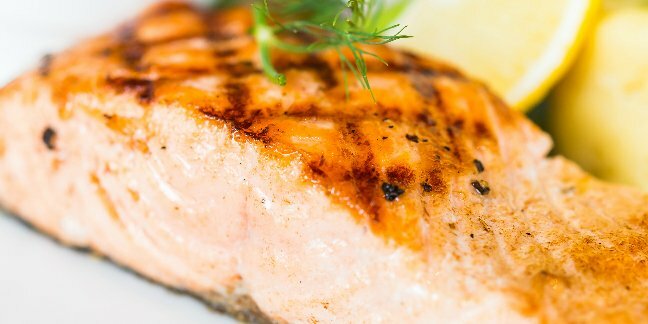 A 2008 study, and many studies done after, indicated that waiting to introduce fish (or other potentially allergenic foods) to your baby may not prevent any atopic (i.e. eczema) disease(s). Fish contain all 9 amino acids – this means that fish is one of the few sources of complete protein. Our bodies do not make amino acids, we must get them from the foods we eat. Offering your little one fish is a very healthy and nutritious option to get in some Omega 3s. Fish are amazing sources of pure Omega 3s not to mention all sorts of wonderfully healthy nutrients that growing babies need. The Omega 3’s in fish are powerful indeed and may even help little one’s who have eczema or other skin ailments. Stick with the white fish when introducing your little one to fish as these are the mild, less “fishy” tasting of all fish . Protein – 20 grams – WOW. Vitamin A – 54 I.U. Fresh whole fish also should have bright red gills free from slime. If the flesh doesn’t spring back when pressed, the fish isn’t fresh. Ask the seller to press on the fish for you and watch for the spring-back. The fish should smell fresh and mild, not fishy or ammonia-like. Fish may be poached, broiled or baked. Baking will help the fish maintain more nutrients and is always recommended as the best way to cook fish. Poaching fish is a great way to prepare fish for baby. Poaching fish for fish baby food recipes will allow you to create yummy fish dishes that are flavorful and exciting for baby’s tastebuds. Ensure that the fish you will be using in your fish baby food recipes is thoroughly de-boned. Consider poaching fish baby food recipes using a Homemade Stock for extra flavor. Step 1: Bring water to simmer (with spices added) in a small frying pan or pot round enough to lay the fish flat. Step 2: Pat filet dry with a paper towel. Step 3: Add filet to the water in the pan and poach (a fancy way of saying simmer.) the fish until it turns totally white. Step 4: Remove from heat and let the fish sit for 5 minutes more to complete cooking. Step 5: Chop, crumble or even mash or puree the poached fish and serve. Bring water to simmer (with spices added) in a small frying pan or pot round enough to lay the fish flat. Your baby is getting older, maybe she is 9, 10, or 11 months old now. You’re tired of the same old boring purées and want to branch out into more adventurous baby cuisine. Try these tasty Fish Recipes that may be used for Baby “Meals”. These “baby” recipes are recipes for fish that the whole family may enjoy and eat. These Fish Baby Meal recipes should all be suitable for those non-allergic babies who are 9-10 months of age and over. Please note however that some ingredients may not be suitable for a baby under 12 months of age. Use your discretion to substitute ingredients as needed. I have included my own substitutions when I was making baby food for my “older” babies” Items with a ** beside the recipe ingredient indicates the ingredient may need substituting. Step 1: In a small bowl, combine the milk and salt. In a separate bowl, mix together the bread crumbs, Parmesan cheese, thyme, basil, pepper, paprika, and garlic powder . Step 2: Dip the haddock fillets in the milk, (we prefer milk over egg because we like the coating to gently fall off and create a nice crunchy “topping” to sprinkle over when the fish is finished baking.). Step 3: Coat the Cod with the Bread Crumb mix. Place Cod fillets in a glass baking dish, and drizzle with melted butter. Step 4: Bake at 400, on the top rack of the preheated oven until the fish flakes easily, about 15-25 minutes. Keep a good watch and remove from oven once you see the fish flaky. Step 1: Toss all ingredients into a bowl and mix. The mixture will be thick yet fluffy. Step 2: Spread mixture over Cod, Haddock, Tilapia, Flounder (add lemon juice for the flounder.) or even orange roughy (we prefer to prepare orange roughy a different way but it does work with orange roughy). Step 1: Lightly olive oil a medium baking pan. In a shallow bowl, mix bread crumbs, Parmesan cheese, Romano cheese, garlic powder,basil, pepper, paprika and salt. Step 2: Brush both sides of the fillets with butter, and coat with the bread crumb mixture. Step 3: Arrange fillets in a single layer in the prepared baking dish, and squeeze lemon juice over them. Step 4:Bake at 400 degrees in preheated oven 10 to 15 minutes, or until the fishgets flaky. Step 1: Warm oil in a large skillet over medium-high heat. Step 2:Whisk together egg and milk until a bit frothy then coat the cod fillets with flour; shake off any excess flour. Step 3: Dip the cod fillets in the egg mixture then coat cod with the oats. Step 4:Fry the cod for approx. 3 minutes on one side then turn over the fillets and fry about 3 minutes more. Step 5:Drain on paper towels. Season to taste. Step 1: Bring the water and rice to a boil in a pot. Cover, reduce heat to low, and simmer 45 minutes. Step 2: Heat the oil in a skillet over medium-high heat. Stir in the onion and garlic, and cook 1 minute. Step 3:Mix in cod, and season with curry powder, chili powder, turmeric, cumin, salt, and pepper. Pour in the coconut milk, and mix in frozen vegetables. Cover, and cook 10 minutes, or until vegetables are tender and cod is easily flaked with a fork. Step 4:Drain 1/2 cup liquid from the skillet into a bowl, and mix with cornstarch. Stir back into skillet to thicken sauce. Serve over the cooked rice. Step 1: Lightly oil a shallow, 2 quart baking dish. Step 2: In a medium bowl, toss the potatoes with 2 tablespoons olive oil to coat evenly. Season with salt and pepper. Spread potatoes in baking dish with 1/4 cup water. Cover, and bake for 15 minutes. Step 3: Combine bell peppers, leek, zucchini, and celery in a medium bowl. Toss with garlic and 2 tablespoons olive oil,. Season to taste with salt, garlic and pepper. Step 4: Spread vegetables over potatoes, add another 1/4 cup water, and cover. Bake for 10 to 15 minutes in a preheated oven to 425 degrees F.
Step 5: When the above is finished baking, rinse, and cut fish into 1 to 1 1/2 inch cubes, and spread the fish over vegetables. Cover. Bake for 10 minutes, or until fish flakes easily. After this step, you may eat. Step 1: Grease an 8x 12 inch baking dish then bring a large pot of lightly salted water to a boil. Add cod fillets and cook for 4 to 6 minutes; drain. Step 2: Make a Roux – Melt margarine (butter) in a medium saucepan. Remove from heat and mix in the flour and milk. Return to stove over medium heat, and stir until thickened. Season the Roux with pinch of salt, garlic, basil and pepper. Step 3: Flake the boiled fish into baking dish, alternating layers with sauce. Sprinkle top with shredded cheese. Step 2: Melt the butter in a medium saucepan over medium heat. Mix in lemon juice, salt, pepper, parsley flakes, and garlic. Bring to a boil. Cook and stir about 10 minutes, until thickened. Step 3: Arrange cod fillets in a single layer on a medium baking sheet. Cover with 1/2 the butter mixture, and sprinkle with lemon pepper. Cover with foil. Step 4: Bake 15 to 20 minutes in the preheated oven, until fish is easily flaked with a fork. Pour the remaining butter mixture over the fish to serve.